I am new to model flying and building having only started in the hobby in August 2013. I started by assembling a irvine tutor 2, joined a club and started with Some flight training before the weather started getting in the way. I decided that I would join in the fun of the mass build and choose the Dawn Flyer as I liked the look of it. First up I have been reading and following the other blogs on the Dawn Flyer builds and these have been a great help to a beginner like me in particular BEB's blog which is very detailed. Having obtained plans and wood packs my first decision was what to use as my building station. Given that I do not have a garage and my shed needed a good tidy out before it could be used I came to the conclusion that the build would be indoors and that limited my space. After some ideas and information from the people on here I decided to create a building surface that I could move / store in as necessary. The base of my surface is a DIY workbench, I then provided a 600x1200mm flat surface in the form of a 18mm think melamine board which I attached a 70mm deep wooden support to grip in the workbench. This provided a sturdy flat surface to place my balsa building board I purchased from SLEC. So now I have a building surface which is really flat and just the job. Next I sourced some tools to assist with the build and some glues. I used BEB's blog for a list of tools I would need, and visited several web sites to locate some good quality model glues, again thanks to people on here I ended up ordering glues from deluxe materials. I already had several rules and straight edges so no need to get them. Now I sat back and waited for all the goodies to arrive. So where to start, I decided on three places so I could be doing something whilst waiting on others to dry etc. 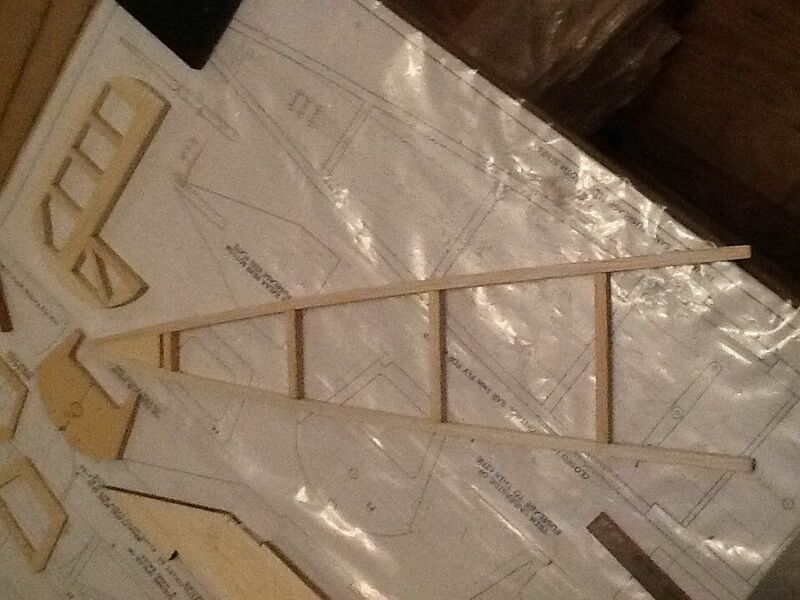 So I picked the rudder to start and created the shape with blocks of balsa and glued them together at this stage i did not have the exact shape but shaped after the glue had dried. This is what I ended up with. The upper part of the back end of the fus was next. Following BEB's example I added a triangular fill at the end where the 6mm strips joined to add strength and make the join easier. And then the main fus itself with the longerons, strengtheners, and f2 glued in place. Clamps, clamps and more clamps. When you've got enough clamps, go get some more! Honestly the more you have the better. Don't forget the good ole elastic band and masking or sellotape, they both have their uses. Get a set of French curves, invaluable especially when extending or making new ribs etc. One tip with straight edges and the use of scalpels, glue some balsa strip on your straight edges as a finger stop. This way when you are holding the straight edge on the piece you are cutting, the finger stop stops your pinkies hanging over the edge of the straight edge, and stops you removing the tips off your fingers when you rune the scalpel along the edge. Trust me, been there and done it hundreds of times. With a fresh blade you don't even know that you have cut the tips until you see the blood on the work piece. All of my straight edges have this balsa strip now. Superglue is ok, but it is best to use aliphatic glue when building with balsa. Yes it takes longer to dry, BUT, superglue joints are brittle and can give way after time. Also longer drying time allows for spot on positioning. I use Titebond yellow, that's the bottle with the red label as there are a couple of different types used for different woods). Avoid bog standard PVA as it is rubbery. You may also find use in polyurethane glue. This is also excellent for a strong bond but it does foam up and expand, so use ever so sparingly and make sure you clamp any joints as the expansion will push an unclamped joint apart. If you do use this type of glue, lightly moisten one part with water, and by that I mean dip you finger in water and just rub it along the where you want to glue, or use a model brush. It only has to be a tiny amount of damp to help speed up the curing process. It is excellent glue, don't dismiss it from your arsenal. Epoxy is great, but can be heavy if used in large amounts, so use ONLY where necessary. Thank you, this is both exiting and daunting at the same time. I hope to be a little more detailed in the rest if the build but decided to create this blog after already starting the build so playing catchup. Yes I brought loads of clamps but think I still need more. At the moment I have only used aliphatic resin for my joints. It takes a while to dry but seems very strong. I did some testing on scrap balsa and the balsa breaks before the glue joint. some good tips for keeping the ends of my fingers, etc. this is why I like this forum I have learnt so much already. 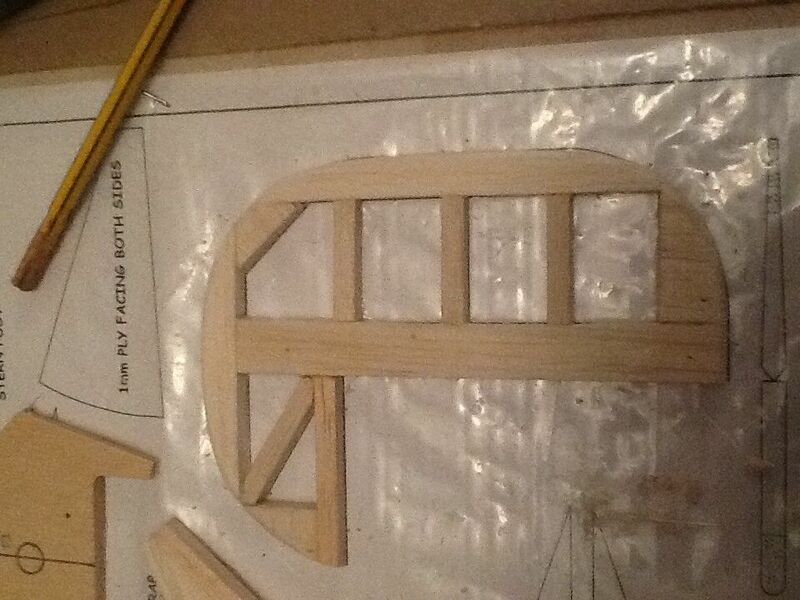 Wished I had known about french curves before I started shaping the rudder probably would have made it easier. Must get some to add to my toolkit. Re F4, I think it's drawn correctly so I'd suggest gluing the upper rear longerons to your fuselage sides and then laying this over the plan inverted and building the rest of the back end to the plan, you may need to pin some balsa blocks to the plan to keep it in shape..
Re F1 this is based on the distance from the back of your motor mount to the face of the prop driver which could be from 6 to 10mm from the the front face of the furthermost part of FC including the balsa cowl. 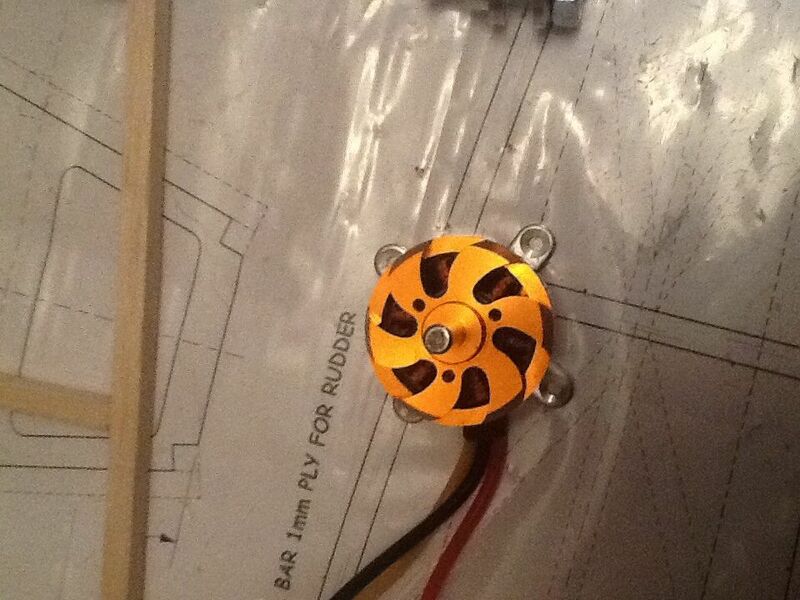 Lay your motor and prop over the plan to see what it looks like. Can you post a picture of you motor bits to see what you have. Nice start Darren - well done! yes F4 too narrow is a common problem. Lots of ways around it. John's mentioned one, if you look at my blog I do another. Yet others have trimmed the last cross piece of the tail upper. One thing about building - there is definitely more than one way to skin a cat! Put another way,....an old aeromodelling motto,...Ask 6 modellers how to do something and you'll get 7 opinions. 8 of which will be right! Not to give a 9th opinion I just say it looks good so far! The more Dawn Flyers the better! Well here's my motor and the other bits this is the first electric motor I have seen, so I guess the grip end of the bolt goes on the motor drive shaft.and the prop in between that and the washer and bolt. Yes Darran that is correct. 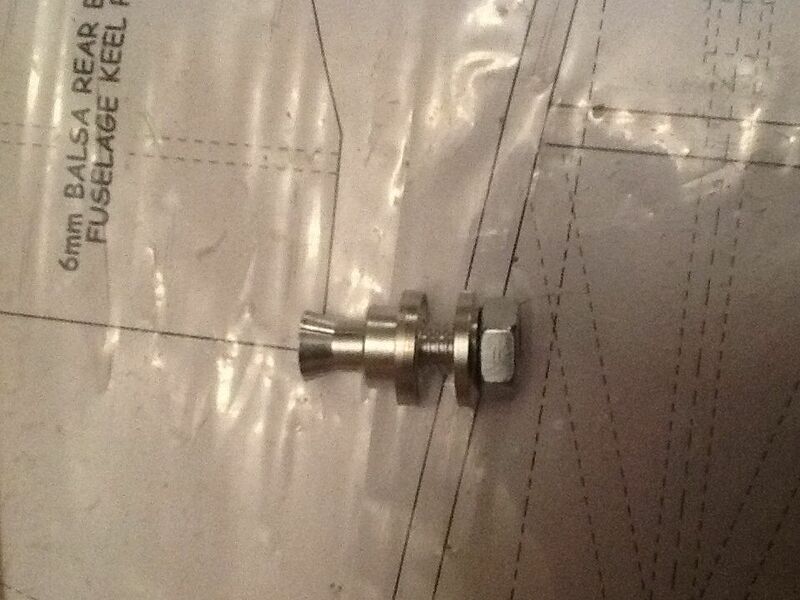 The nut will push the prop downwards and thus the lower collet will squeeze the bell end and grip the shaft. My next challenge is working out how FC actually fits at the front. My first thought and looking at BEB's blog was that it fits at the front of the fus inside, however if I offer this up straight with the bottom notch on the longeron it appears to be way to big. looking again at BEB's fitted FC I am now not sure that it is fitted in this way as from some photos it looks like it fits on the front of the fus and not inside. also if I offer the fus up to the plan without FC fitted on the end it looks to be a little short. Can someone advise on wether it fits inside the fus or on the front of the fus. So I guess that the backplate on the collet that the prop pushes against should be outside of gauze in the front cowl giving enough clearance for the prop. I plan to add a cowl similar to BEB's in his blog where he sandwiched a piece of gauze in between two balsa pieces. does the collet have to fit all the way down the shaft of the motor or is this design with the bell grip designed to allow a little adjustment depending on the exit through FC and the cowl. 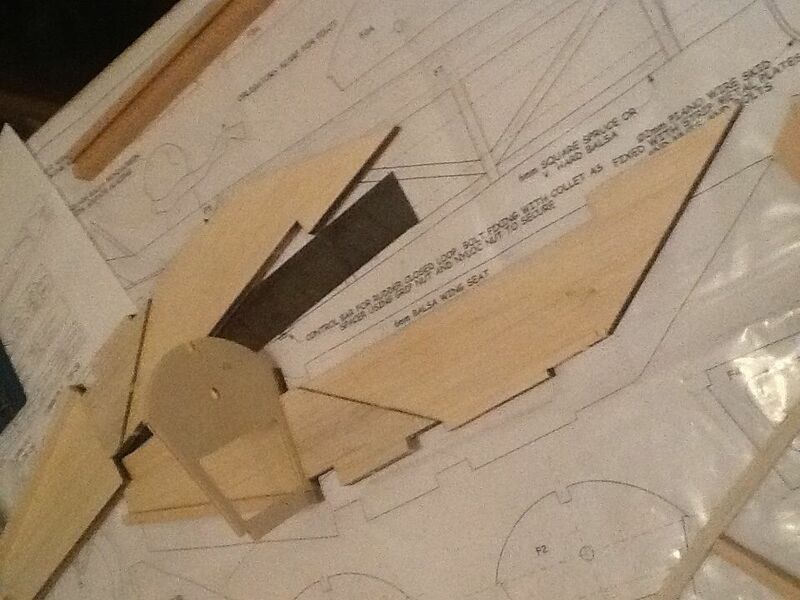 I fitted my FC on the inside of the fuselage sides which looks right according to the plan.